This is a word that paints a different mental picture for each of us. If you are a homeowner in the middle of a construction project, the image of your kitchen covered in drywall dust, or backyard piled high with demolition debris, may come to mind. For a Next Step Volunteer, their mind may flash back to leaving the worksite covered in paint or mud from a hard day’s work. If you’ve served on Summer Staff, you may envision a kitchen filled with the week’s Sysco order, or foot washing buckets filled with dirty water after Thursday night service. In Mark 10:13-16 we review an account of Jesus encountering what could potentially be identified as the world’s most ‘messy’ members- young children. If you have any of your own, you know exactly what I’m talking about. Between poopy diapers, perpetually wearing their last meal on their shirt, and those ever-running noses, any mom will tell you that ‘messy’ is the perfect word to describe their little ones. Be encouraged, friends, as we learn through construction that mess is a VITAL part of restoration. That without demolishing the old, the new cannot take shape. 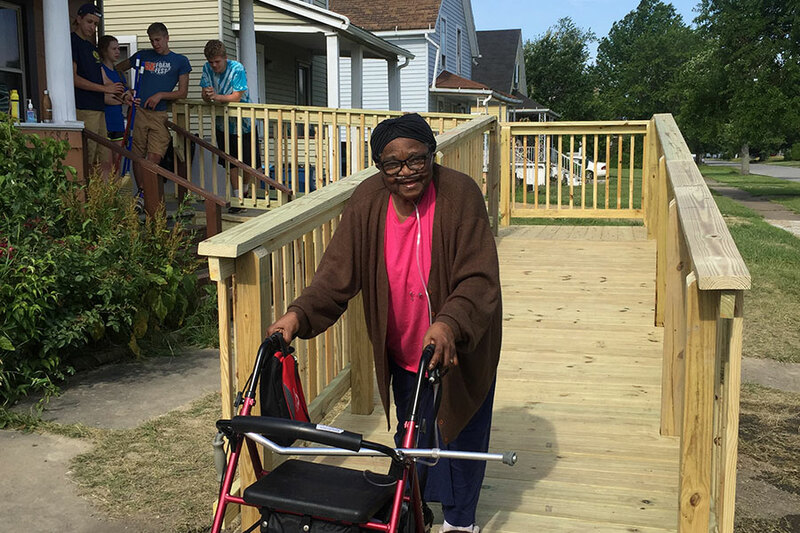 Without spending hours digging post holes in the mud, Ms. Dora would not have her new and beautiful wheelchair ramp. Without tearing out the molded flooring in Billy’s bathroom, sturdy flooring could not be installed. And without sanding drywall mud in April’s kitchen, the final fresh coat of paint could not go on smoothly. So this month, celebrate mess with us. Just as Jesus welcomed those children, He welcomes us and all the baggage we bring. Rejoice with us that we serve a God who doesn’t just tolerate messes, but requires them as a means to reshape and reconstruct our identity in Him. Let us reshape how we interpret ‘mess’ and begin to view it as a vital part of the construction work God is doing in each of us.